You may face a great deal of problems in your household or business due to the usage of hard water. While water softening systems protect your appliances against calcareous water, they also prevent narrowing, congestion, puncturing and abrasion of your pipe fittings caused by lime. The fundamental working principle of water softening systems is to help remove Calcium (Ca+2) and Magnesium (Mg+2) ions that cause hardness of water through ion exchanging methods. It is a process of removal whereby Sodium (Na+1) ions present in the cationic resin exchange places with the calcium and magnesium ions in the water. After this process, the saturated resin must be regenerated with a time or flow controlled regeneration procedure. Through the painstaking efforts of our engineers, A.O. Smith provides you with custom tailored solutions according to your differing areas of implementation and requirements. Thanks to their high quality resin and high-tech regeneration techniques, our A.O. Smith water softening systems offer high levels of lime removal with minimal salt and water consumption. As a result, the calcification problems that occur in pipe fittings, washing, heating and boiling systems within your homes are eliminated. You obtain high levels of energy consumption and efficiency. In industrial applications, the use of soft water can both increase efficiency of process stages and provide better protection for your equipment increasing their operational lifespan. In industries where the use of soft water is crucial, layers of lime residue caused by hard water can cause heat and energy losses and can also cause serious damage to your machinery and large amounts of financial loss. A.O. 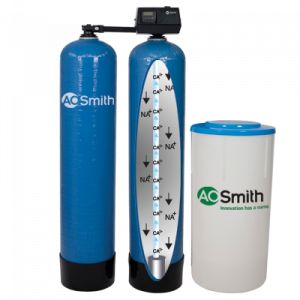 Smith high capacity water softening systems are custom designed to meet your requirements. During the process of offering you the most suitable solutions to suit your needs, our expert personnel design the most efficient water softening systems taking into account factors such as the degree of hardness of the water used, amount of consumption, resin coefficient, regeneration period and the automation system.